The Olympus Rally and I have a pretty tumultuous relationship. 2015 was no different, though the team had higher hopes. Al Kun brought back the big orange Volvo with a special surprise: turrrrrrrbo power! However, I think I'm starting to really like naturally aspirated engines for their reliability. Well, turbo engines seem to be reliable, just reliably destroying themselves in small ways at every rally. Al's turbo Volvo didn't wait around to blow up. We made it through the first stage, but not the second. We spent a significant amount of time hanging out with the volunteer start crew at stage three. I think we might have limped there or got flat towed there by our awesome PNW sweep team, but details are as hazy as a coolant-covered windshield. After my brother drove out and picked us up in the service truck, him and Al tore into the engine and diagnosed the problem. 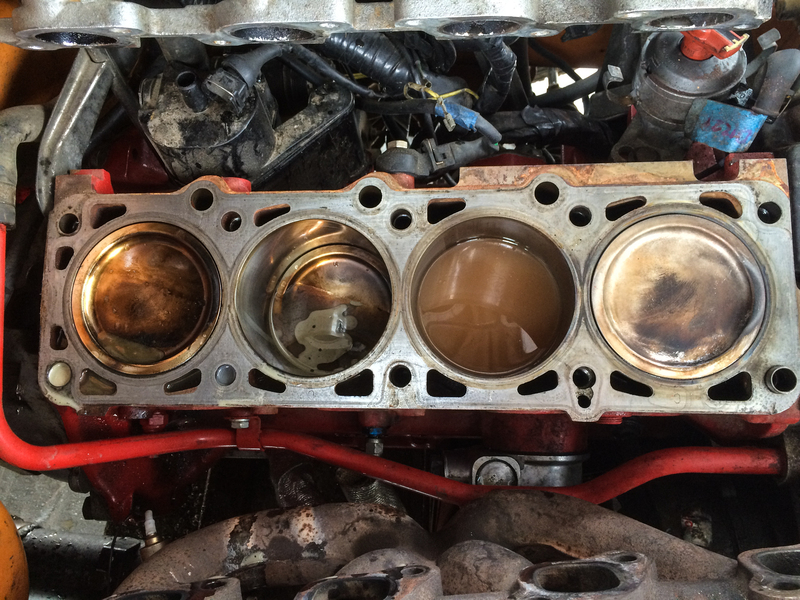 Turns out the head basically melted over cylinder 1 and bad things happened after that. Like cylinders full of water/coolant. Turbos are dumb. With a lot of encouragement, we got Al to commit to continue the next day. We tried to find parts locally but were struggling. It was looking bleak for the rally until fellow rallyist and generally good person Cody Crane volunteered to drive up a spare Volvo head and picked up all the other necessary parts from Portland. The boys worked until the early hours of the morning slapping that bad boy on the ol' Volvo so we could try again on Sunday. I'm pretty much useless in service, so I just ate snacks. After the fine work of the service crew and help from others in the park (Robert Culbertson and a couple other folks I can't remember), the Volvo once again breathed fire. Sunday went much better! We almost finished! I mean literally a couple hundred yards from the finish line. Had it been downhill or had we been able to see out of the windshield at all, we might have continued blasting steam and oil into the world until we reached the final stop. And then probably have to be towed back to service, to be honest, but still. Had the car not blown up again, we might have placed 3rd in class, even with some stage times within 10 seconds of the leader. This time, it wasn't the turbo's fault (probably), the skidplate detached itself and smashed into some important parts like radiators and what not. In a post-race teardown, Al tells me the head needs replacing again, though. So... turbos are still dumb.